I have done many reviews for Rose Publishing over the past few years. Then I saw an announcement that they were purchased by another company earlier this year. Long story short, I found out that this new company was Hendrickson Publishers and they had a review type program as well. I was very excited so I contacted them and received two different Bibles. This review is my first one for them and it is for The Complete Jewish Study Bible: Insights for Jews & Christians. I am very honored to do this review and I think this particular Bible fills a very unique spot that many people will find very beneficial in their study of God’s Word. The “Complete Jewish Study Bible: Insights for Jews & Christians” fills a very unique spot as it very clearly presents the Word of God from a Jewish perspective. We do often think of Jesus from a very western perspective, but Jesus was Jewish and lived in a very Jewish culture. This Study Bible has some features that I absolutely love. This is a different translation than most people may be used to. I won’t go into the specifics about how it was translated, but at a high level the Complete Jewish New Testament was originally translated in 1989 by Dr. David H. Stern with the Old Testament portion completed in 1998. 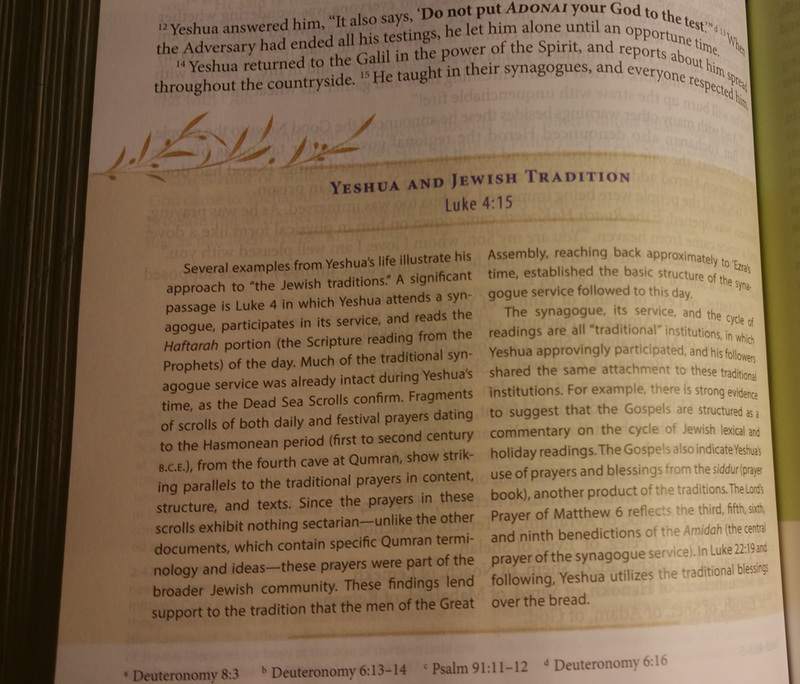 He did this translation in the attempt to “restore God’s Word to its original Jewish context and culture as well as be in easily read modern English.” This translation was initially geared toward Messianic Jewish congregations, but Christians can get a lot out of this Study Bible to help understand Scripture from the Jewish perspective that Jesus (Yeshua) would have had. The study notes and articles are written by both Messianic Jews as well as Christian theologians as well. This is a very interesting Bible to have and use as it helps to put the Jewish context back into the Scriptures. It will help to understand more of the culture that existed in the Ancient Near East (A.N.E.) 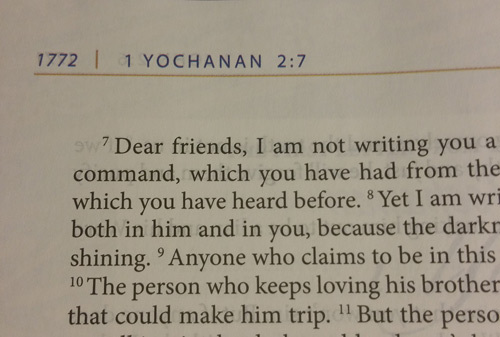 when Scriptures were written. We covered this concept of the need for understanding this culture in our church in our Inductive Bible Study training classes that we did. One note about this translation is that it may take you some time to get used to the fact that they used the names from the traditional Hebrew rather than the Greek names. With that said, after a while, you actually start picking up some (although very limited) Hebrew. Also, you will need to get used to a different sequence of the books of the Old Testament (Tanakh) as well as a different number of books as the Jewish Old Testament combines some books into one. For example 1st and 2nd Samuel are grouped as one book, as are some others such as the Twelve Minor Prophets grouped into one. Outside of some of these things to get used to, I would highly recommend this as an additional translation to have for your Bible studies. I received a copy of this Study Bible in exchange for this review from Hendrickson Publishers and all opinions are my own. Price: At the time of writing this review, the cheapest place to get this book is at Christianbook.com. They have it for $28.99– suggested retail from the publisher is $49.95. Please note that these prices do not include any potential shipping charges. The books of the Tanakh (Old Testament) listed in traditional (canonical) Old Testament order. This section gives a very nice summary of the Rabbinic Literature as this literature really helps quite toward an understanding and appreciation for the Jewish background and the culture and context of the Jewish faith that we as Christians were grafted into. This is an excellent section that gives you insight as to the reasons and how this particular Study Bible was created. Gives an excellent overview of the different features incorporated in this Study Bible. I am always very surprised to find out how many people go and buy some kind of Study Bible, but never look at this type of section to learn how to use the Study Bible to its full potential. Often, this section is overlooked to the detriment of the studies for the person. 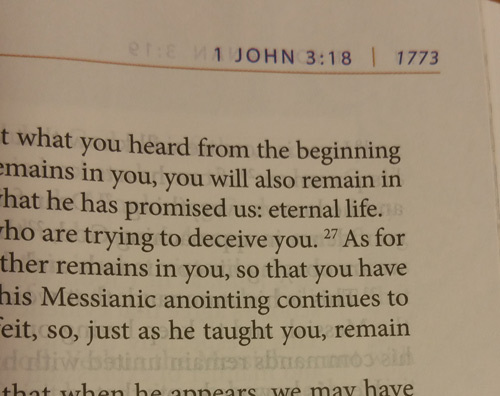 This honestly is the most detailed and complete letter about the translation that I have seen in any Bible to date. It provides background to the actual translation including methodology, background on the translator. I can’t emphasize enough the importance of reading these types of articles in all Bibles – it helps you to understand more of the background of the translation and the drive behind the particular translation. In most Study Bibles, they have a section between the Old Testament and New Testament. Interestingly, this Study Bible does not and I believe it is in an attempt to keep the flow of the overall story. Too often, we think of the Old and New Testaments as very separate things. Rather, we should look at them as equal parts to the story of God’s redemption and restoration of mankind back into correct relationship with Him. 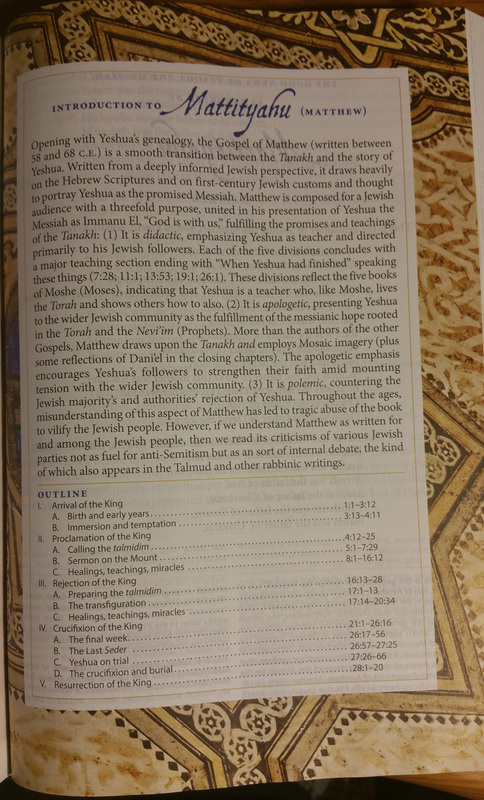 I think it was done very nicely with how they go right from the “last page” of the Old Testament to the book introduction of Mattityahu (Matthew). The Book Introductions are written very well to give you the background as to who the author of a book is (or is thought to be), to whom the author wrote the book as well as when it was written. What I really like more about these book introductions is how they are written to help you understand the Jewish side of scripture and subjects that are contained within the book. Overall, these book introductions are brief, but such an excellent tool to help you study this Bible more effectively. Like most Study Bibles, this one has some study notes on almost all of the pages of Scripture. I do like how there aren’t an overload of study notes, but rather a nice balance that gives the reader some excellent insight to the Jewish culture. There are a large number of topical articles throughout the Complete Jewish Study Bible that really help the reader to understand the Jewish context that really do reside within the Scriptures for both the Old and New Testaments. 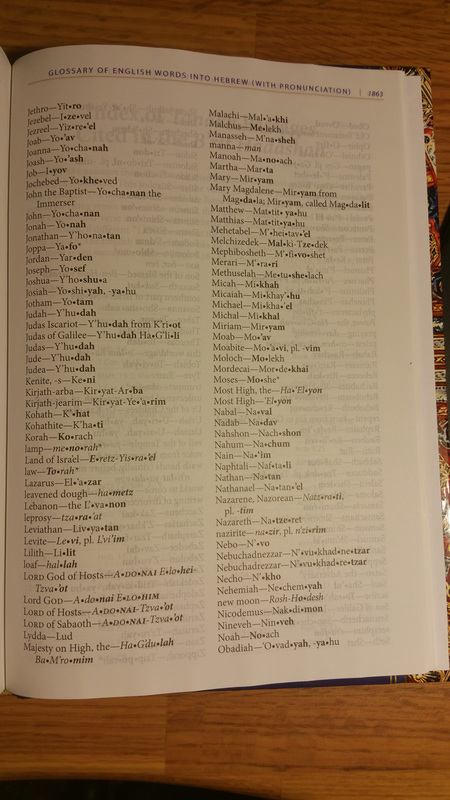 The names in this Study Bible (and the text version CJB) are Jewish names. It may take a while to get used to seeing Sha’ul rather than Paul as you are reading the Scriptures, but you will pick most of it up fairly quickly. The handy indexes in the back are very helpful with this. 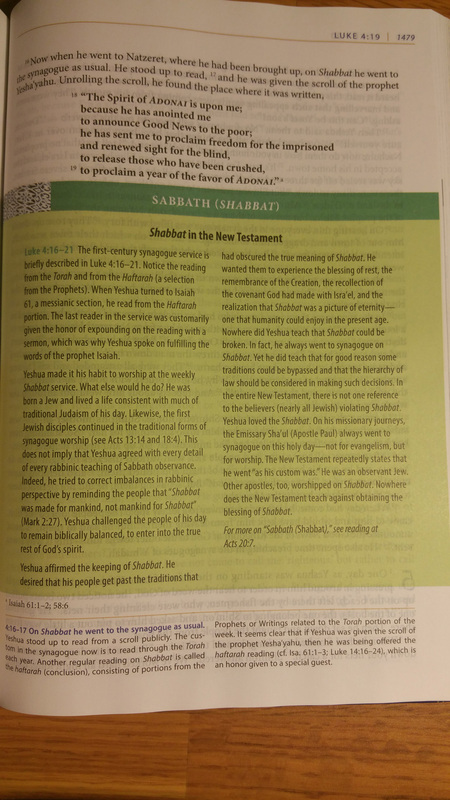 Some of the Old Testament and New Testament books are also in Hebrew (like 1 Yochanan for 1 John), but in an excellent design decision, they put the Hebrew name in the header on the left page with the more familiar Greek name on the header on the right page. I really have liked this feature when you see it in a Bible. I have seen it in many Bibles for the HCSB (Hollman Christian Standard Bible) and CSB (Christian Standard Bible) translations similar to how they did it in the Complete Jewish Study Bible. They call out the Old Testament (Tanakh) references or quotes in a very easily identifiable bold font and a lower case letter at the end of the quote/phrase. At the bottom footer area of the Scripture text, they put the actual scripture reference so you can easily locate it. 48 pages of a very handy tool to help you understand the many Hebrew words used throughout this Study Bible. Also they give a guide on how to pronounce these words. Very nicely done. 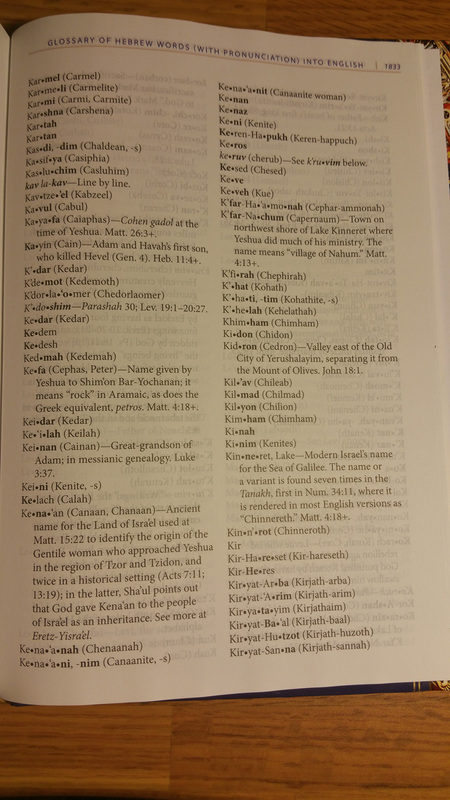 Glossary of English Words into Hebrew (with Pronunciation)This 4-page section is very helpful if you are unsure of the names that you are used to seeing and trying to find what they are called within the Complete Jewish Study Bible. 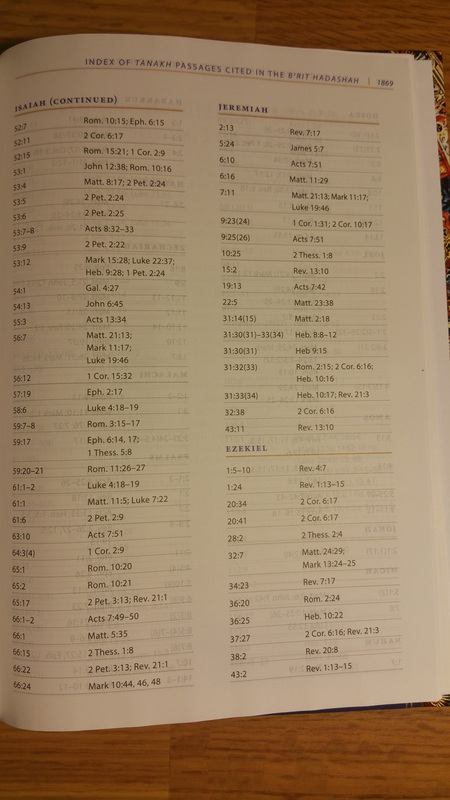 8 pages of listings sorted by Old Testament books and where in the New Testament these Scriptures are cited. I really like this feature with how it plays into other feature of the bold text I mentioned previously in this review. 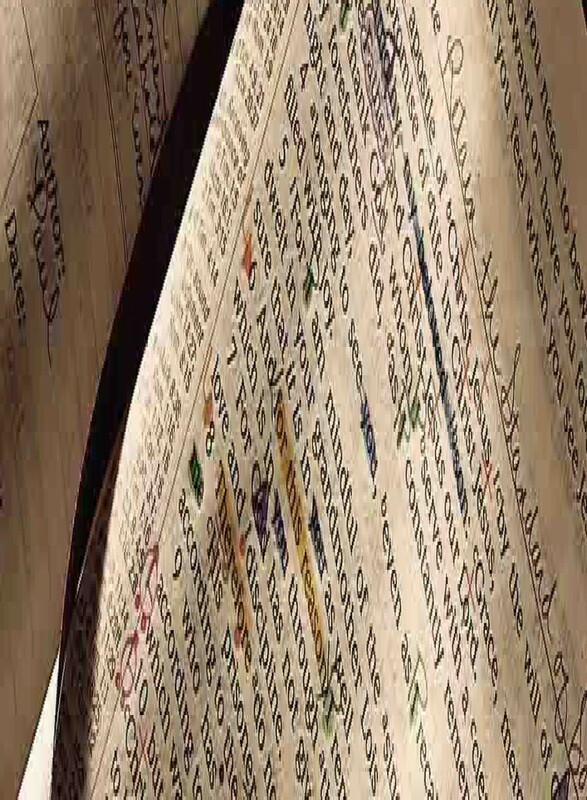 8 pages Scripture readings from the Torah and the Prophets that are read each week in the synagogue on Shabbat (Sabbath) and also during the different festivals, feasts and fasts. This is a quick 2 page index that lists the different Topical Articles which includes the name of the article, the author or source and also the Scripture reference where the article is found. The only thing I would have done differently is to also list the actual page number in the index. 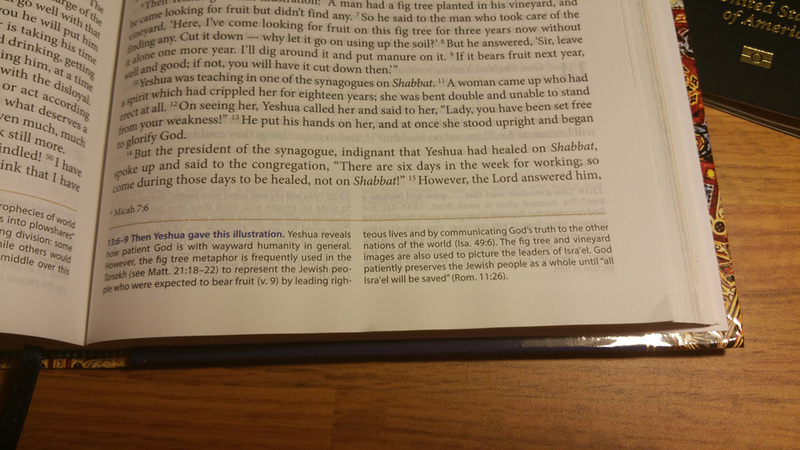 That would have been an easy change that would have made it just a touch more easy for readers to quickly go to those articles (especially since some readers won’t be used to the sequence of Old Testament books in this Study Bible initially). 3 pages of the index that lists out the different Themed Articles. These are grouped by the 12 different themes and includes the title of the article and the Scripture reference where it is found. Similar to the Topical Index section, I would have listed the actual page number in the index. 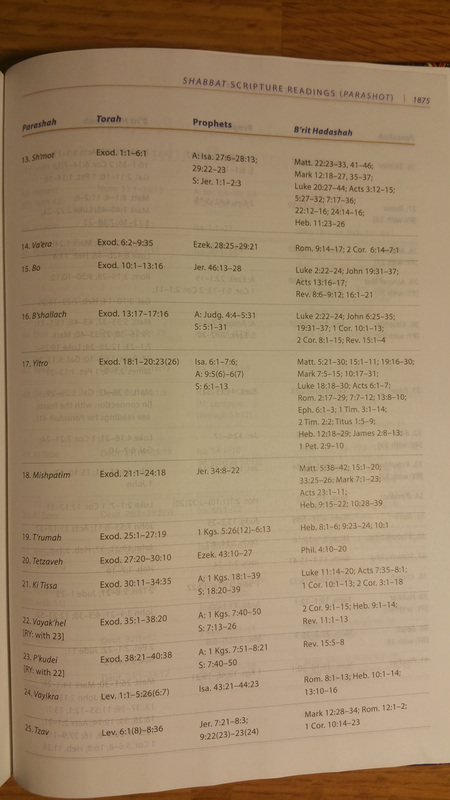 That would have been an easy change that would have made it just a touch more easy for readers to quickly go to those articles (especially since some readers won’t be used to the sequence of Old Testament books in this Study Bible initially). 9 pages of biographies of the different Jewish rabbis and sages throughout the years – includes their names, background on them and also the years. Very helpful for anyone unfamiliar with this background on these people. 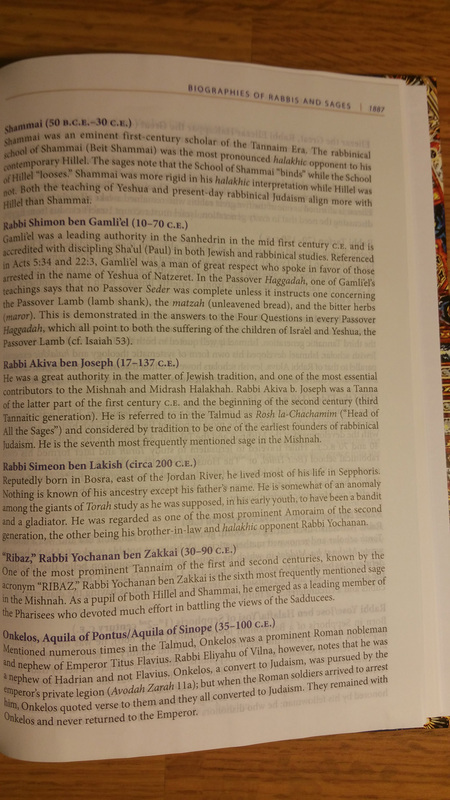 3 pages of the people who contributed to the Complete Jewish Study Bible. 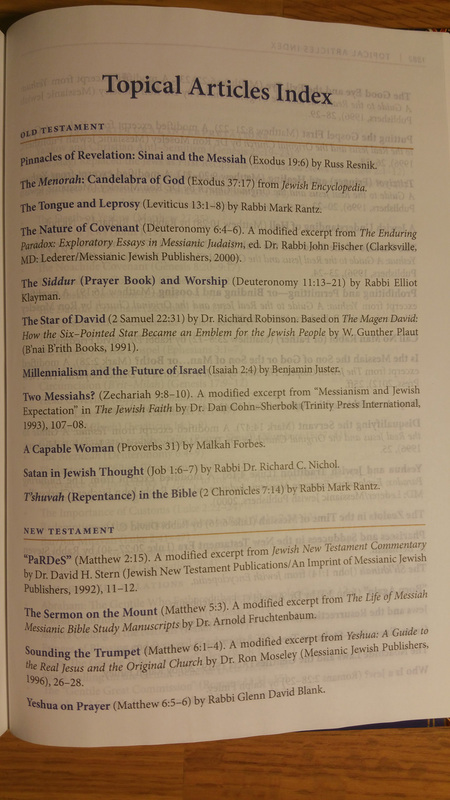 7 pages of the different works that are cited in The Complete Jewish Study Bible and other further reading ideas. A very nice one page biography on Dr. David H. Stern who was the one to create the Complete Jewish Bible translation. 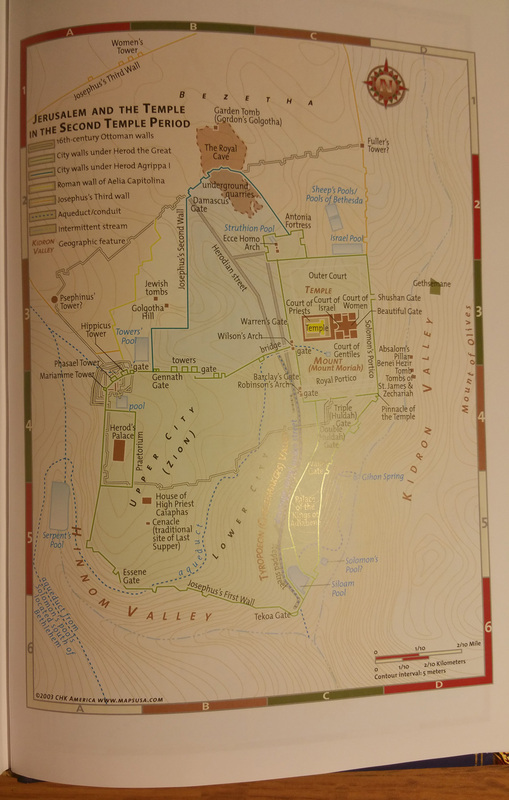 8 pages of full color maps that provide very nice details about many different areas and times covered in the Scriptures. There are a total of 14 maps across these 16 pages. The font on the Study Notes are approximately an 7 point font that is very readable despite the small font size. There is not very much room to write in the outside margins to write in if you desire as it really only has about a 1/2″ margin or so on most pages. However, it does have some more in the poetry type pages due to formatting varying by the amount of characters in the lines of text for these Scriptures. The line-matching (printed lines on the front of the page vs. the back side of the page aren’t consistently lined up. I spot checked through random pages and roughly 70% of the spot checking was line matched while the other was off by about half a line. The paper is really fairly opaque, so I wouldn’t knock down my rating like I have in some other Bibles that I have reviewed in the some of my previous reviews. Quality: 9.2– I never rate a hardcover book higher than a nicely sewn and bound leather book simply due to long-term durability. Basically, this means without proper care, any hardcover bible type will not last as long as the leather-bound sewn version of that same Bible. 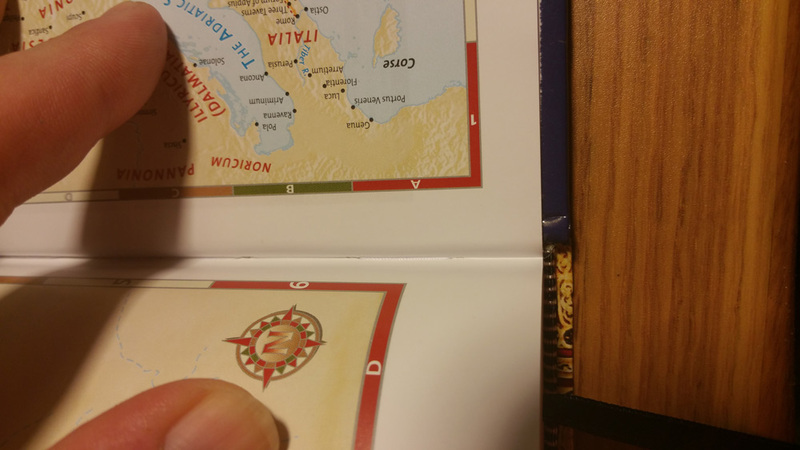 With that said, for a hardcover book, the quality is fine and pretty durable as it is Smyth sewn. You can get this in the premium (calfskin) leather if you are looking for a higher quality binding (see the list below for links to those formats). Appearance: 9.6 – The appearance of this Bible is very clean – design and layout is done very nicely making it a very pleasant experience reading it. The print of this Bible is very good. Value: 9.3 – Basing this rating as a hardcover bible – the value of this Study Bible is good – especially considering the reasonable price for what you get. Some publishers are starting to move away from the more expensive Smyth sewing that helps the durability of the Bible, but I was happy to see Hendrickson stuck with the tried and true method. 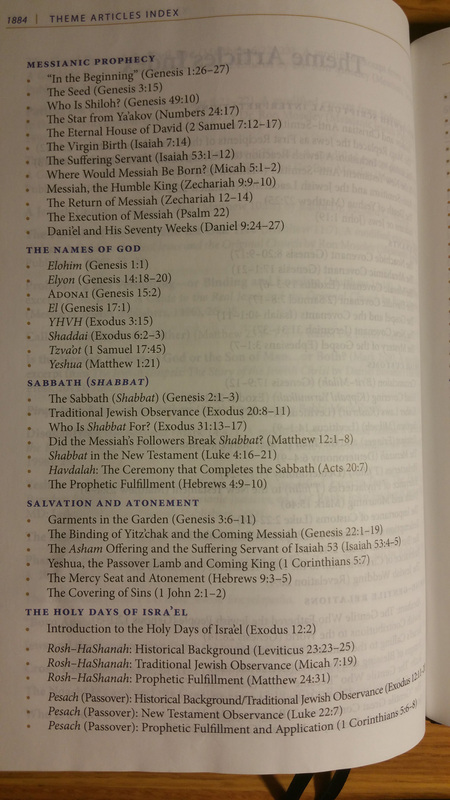 I can honestly say that The Complete Jewish Study Bible is well worth the investment of purchasing a copy for yourself. Innovation: 9.4 – I really like how they bring in the Jewish culture and concepts in The Complete Jewish Study Bible. It really helps immensely with understanding the Word of God better which helps you interpret more accurately and apply the Word more effectively to your life. Their method of handling Old Testament citations within the New Testament is one of the best that I have seen to date. 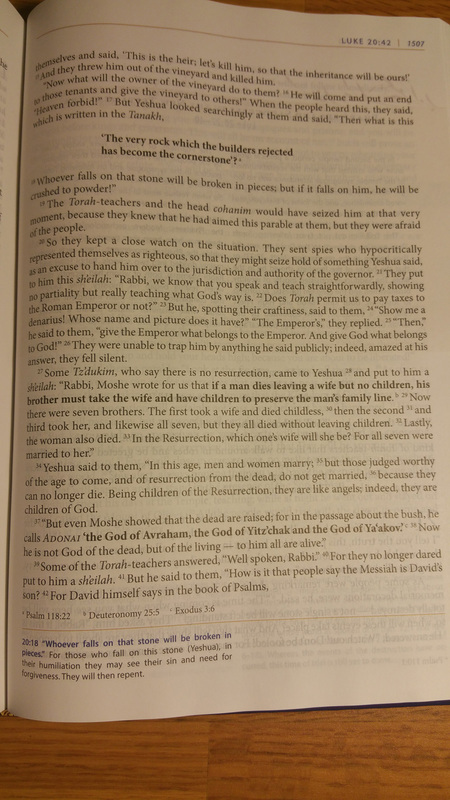 This entry was posted in Bible, CJB, Dr. David H. Stern, Full Color, Hardcover, Hendrickson Publishers, Jewish, Rabbi Barry Rubin, Scriptures, Study Bible, Study Bible Reviews, Word of God and tagged CJB, Complete Jewish Bible, Complete Jewish Study Bible, David H. Stern, Hendrickson Publishers, Rabbi Barry Rubin, Study Bible. Bookmark the permalink. A very thorough and helpful review of a new Bible which I have also scanned myself and looks very good!